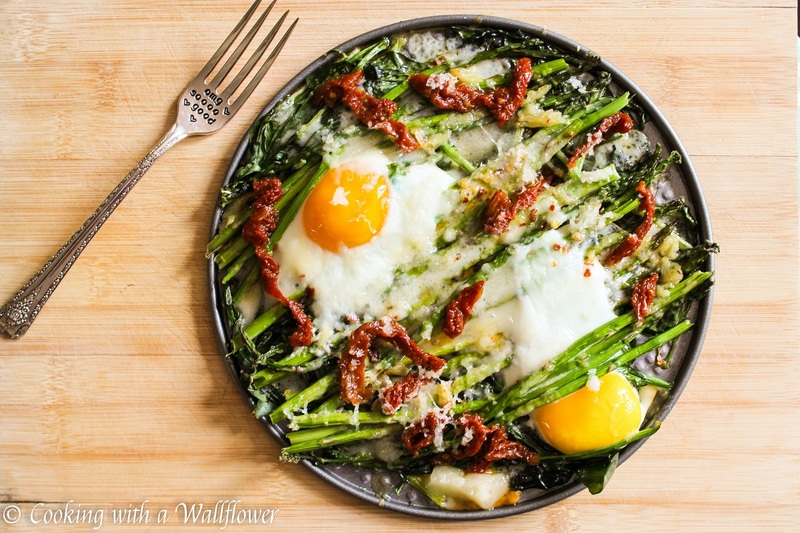 Eggs baked over a bed of asparagus and spinach then topped with sun-dried tomatoes and melted fontina cheese. 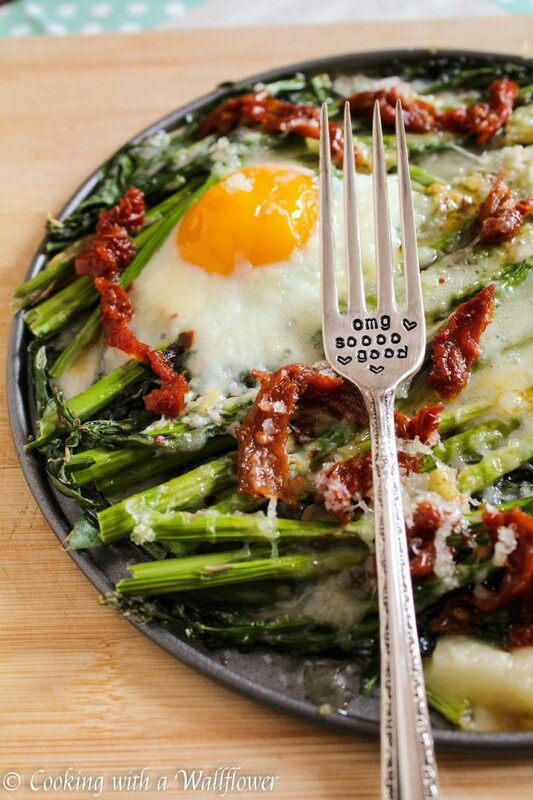 These baked eggs over asparagus and spinach will be the perfect dish for brunch this weekend. Which means, it’s time for brunch because the weekend means we get to sleep in a little longer, right? Well, Sunday for me at least. I work every other Saturday mornings. But! What better way to start your day than with baked eggs? I love this dish because it’s filled with fresh ingredients. Asparagus is just beginning its season, which means you’ll get fresh and tender asparagus stalks for a decent price. Sun-dried tomatoes add an extra flare to any dish. 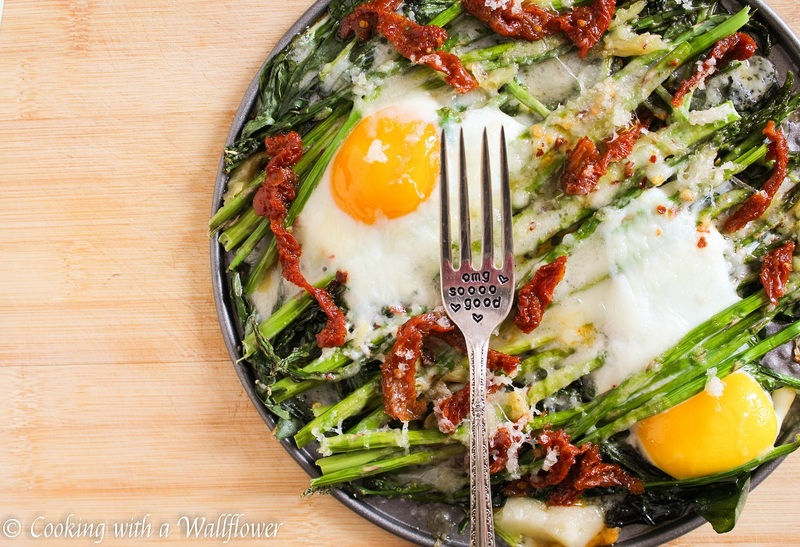 Spinach is always a great addition to any egg dish. Top with a little bit of cheese, some salt, and crushed red peppers, and you have a brunch ready to be served in almost no time. Oh! And don’t you love it when the yolk oozes out the moment you cut into them? Soo good. First, lightly grease your baking sheet or pan with nonstick cooking spray. I used a 9inch springform pan because I like being able to remove the bottom and using the bottom as a platter, but you can use whatever bakeware you like. A 9×9 inch baking pan would be perfect for this dish. Place spinach at the bottom, then top with asparagus. Drizzle about a tablespoon of roasted garlic butter over the asparagus. Crack two eggs over the asparagus. Sprinkle the freshly grate fontina or mozzarella cheese and sun-dried tomatoes in the areas around the eggs. Make sure that the sun-dried tomatoes are completely drained. Otherwise, the vegetables can become very oily. Bake the eggs, asparagus, and spinach in the oven at 400F for about 15 minutes until the eggs are just cooked. Sprinkle salt, pepper, and crushed red pepper on top, to taste. 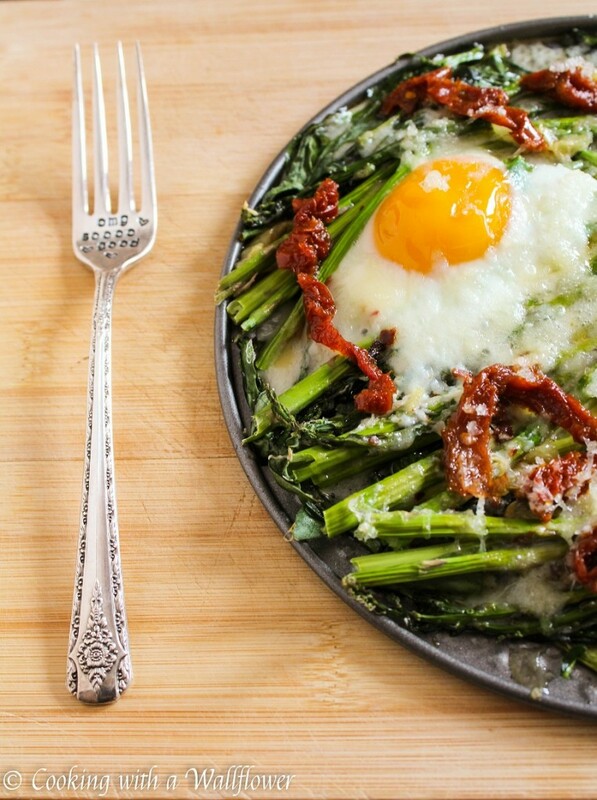 Serve the baked eggs over asparagus and spinach warm. I’d love to see your photos! Tag any photos of my recipes with #cookingwithawallflower, and I’ll stop by to check it out! Lightly grease a baking pan with nonstick cooking spray. 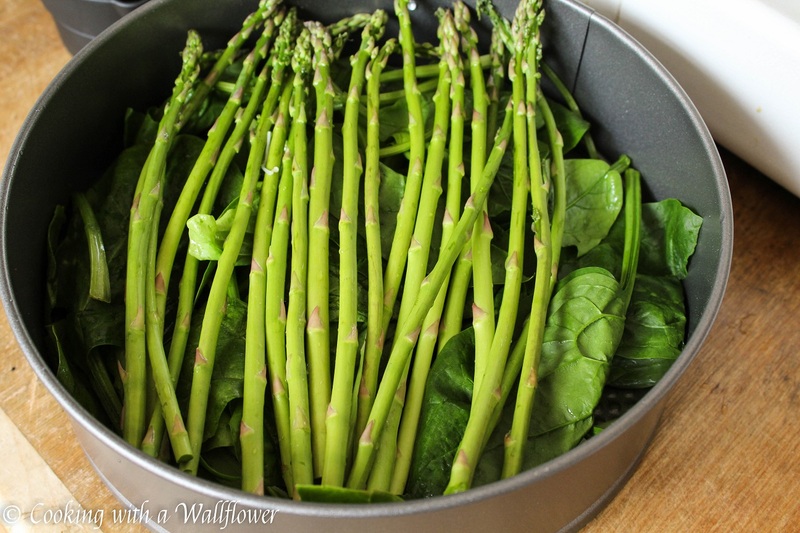 Place a layer of spinach at the bottom, then top with asparagus stalks. Drizzle the garlic infused olive oil (or roasted garlic butter) over the asparagus. Crack two eggs over the asparagus. 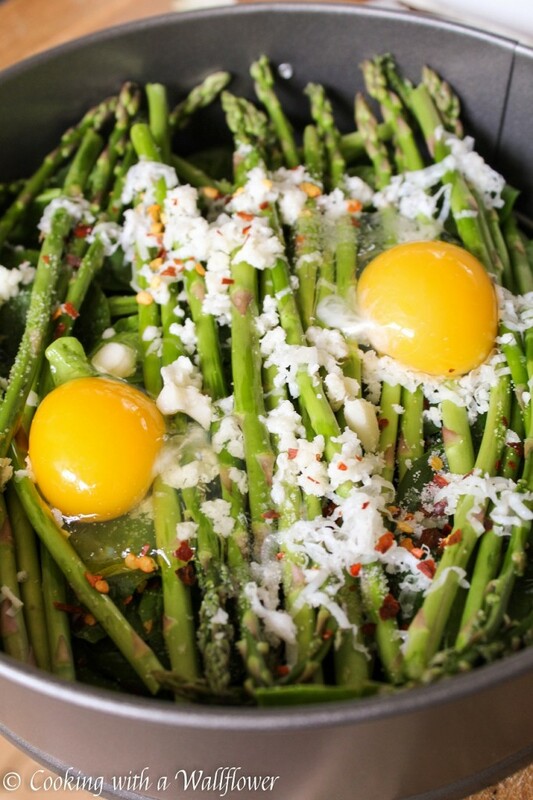 Then place sun-dried tomatoes and freshly grated fontina cheese over the asparagus in areas not covered by the eggs. Bake the eggs in the oven for about 15 minutes until the egg whites look solidified. Serve the baked eggs warm. This entry was posted in Breakfast, Entree, Quick and Easy, Recipes, Vegetarian and tagged breakfast, eggs, quick and easy, recipe. My husband had four eggs, I had one. Proportionate other stuff. Thank you Andrea. I tried this recipe – and it was so good! I’m such a huge fan of your blog! I’m soo glad to hear you liked it! My hubby was just saying that he was craving eggs for dinner, this is absolutely perfect! Dinner done! So glad that I found this! 🙂 I would love for you to share this over at my new link party Making Memories Mondays going on now!